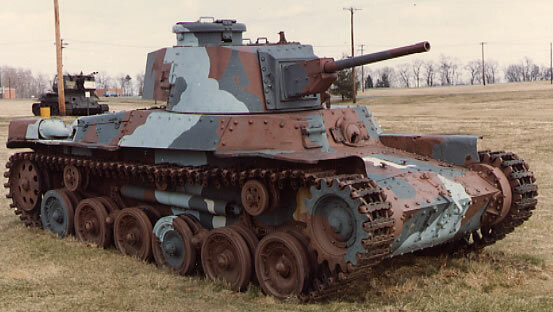 The Japanese Type 97 Chi-Ha Medium Tank was developed to replace the obsolete Type 89, with production of 3000 completed by Mitsubishi. The vehicle had a 2 man turret offset to the right side of the hull housing the 57mm main gun. The driver and bow MG gunner sat up front in the hull with the engine to the rear. It had six paired rubber tyred wheels on each side with spring suspension and front drive. The vehicle was used for a number of variants such as Armoured Recovery Vehicle and command tank which saw the bow MG replaced with a 37mm Main Gun.